Compucert.com can provide NetSim Network Simulators for the CCNA Exam (640-802) - Cisco Certified Network Associate and CCNP - Cisco Certified Network Professional Training Suite training courses. 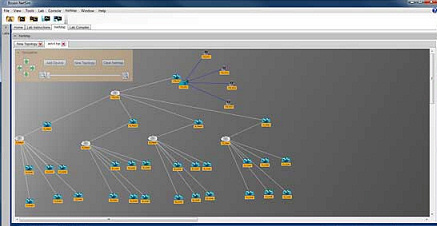 NetSim is an application that simulates Cisco® Systems' networking hardware and software and is designed to aid the user in learning the Cisco IOS® command structure. NetSim can create individual packets that are routed and switched through the simulated network, allowing NetSim to build an appropriate virtual routing table and simulate true networking. Boson NetSim is the only simulation product on the market that supports this level of functionality. NetSim provides more network design versatility and supports more Cisco technologies than any other network simulation software. NetSim software also includes a comprehensive selection of labs that contains lessons covering routing protocols, Cisco devices, switching, topological design and much more. The devices simulated by NetSim's router, switch and workstation components enable Boson to produce labs and technologies within the software that are the most advanced in the industry. These devices enable the user to create custom network that include routers, switches and workstations using a completely customizable drag-and-drop networksimulation. Furthermore, NetSim simulates both switching bridge tables and routing protocol tables to allow you to OUTSIDE of the labs and create your own labs using the Boson Lab Compiler in concert with the NetMap Designer.